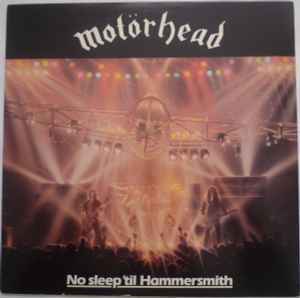 Originally released on June, 1, 1981, this grouping assembles all variations of the "No Sleep 'til Hammersmith" live album as well as its re-releases and subsequent remastered versions (some also contain bonus tracks). Bootlegged versions are also grouped here. Don't know if my version is too old and too heavily played but the bass is real quiet. Sounds good with some bass boost on equalizer. I need a VG+ copy of the stickered sleeve ONLY. Can anyone help? My vinyl is mint and I don't want to have to buy that again too. I ONLY need the sleeve. If your a Motörhead fan; you need this release. Brilliant gig quality record. Feels like you're really there. Did anybody have the same? My version of this release is housed in the original artwork.